An all-purpose zipper is the most commonly available and popular zipper. It is a fairly lightweight zipper with small teeth. The end has a lock which holds the zipper tape together, preventing the ends from coming apart. This is the type of zipper used as a closure in most garments. Dresses, skirts, slacks, and blouses are the type of weight that requires an all-purpose zipper as it tends to bend with a garment; a heavier type of zipper would allow for a seam to bend or flow with the line of the garment. 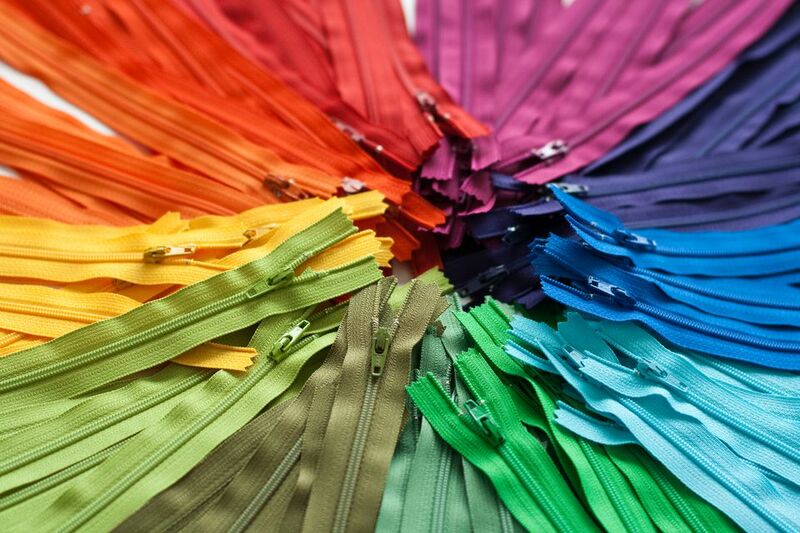 New all-purpose zippers are available in lengths from 4" to 24" at 2" intervals. They are available with polyester or metal teeth that match the color of the zipper tape the teeth are attached to. To replace a zipper when the exact length of the zipper is not available, chose the next longest to the one you're replacing and shorten the zipper to the length you need. An invisible zipper is a zipper with very fine teeth. It's sewn into a garment in such a way that it makes the zipper invisible, hidden in a seam. The only part left visible is the pull tab, and that tends to be smaller or less obtrusive than other types of zippers. No top stitching is needed on an invisible zipper. An invisible zipper is commonly used in formal wear types of clothing. It won't distract from the lines or flow of a gown, for example. Invisible zippers are not available in as many length variations as all-purpose zippers. They are also not available in as many colors, but because they are hidden in the seam, a color that's close is fine. Special sewing machine feet are needed to sew in an invisible zipper, and they're available where invisible zippers are sold. These feet hold the zipper coil so that the stitching is properly placed to keep the zipper invisible. 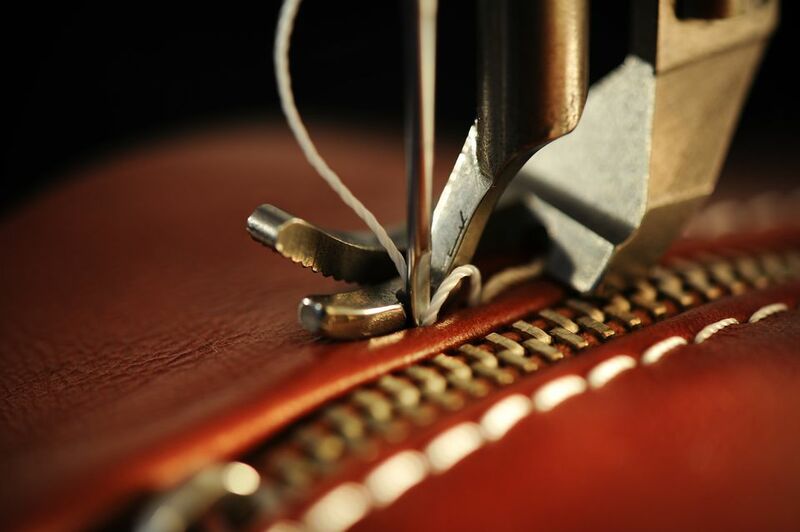 Unlike a regular zipper, when sewing in an invisible zipper, the seam is sewn after the invisible zipper is sewn. Refer to the directions before sewing the zipper area. A trouser zipper is used to sew into pants. It's made with a polyester coil that is woven into the zipper tape with a closed bottom that prevents the bottom of the zipper from separating. The lock on a trouser zipper is strong, preventing embarrassing moments. Jeans zippers have brass teeth and a low-profile slider so the covering flap can lay smoothly. They are a durable, strong zipper to match the durability of jeans, and the stress on the zipper when they are worn skin tight. Separating zippers open at the bottom, allowing both sides of the zipper to come apart as in a jacket zipper. The separating zipper needed depends on the garment. Length and teeth weight are the primary considerations. A metal zipper weighs more than a polyester or plastic tooth zipper. For example, a lightweight fleece jacket would sag with the weight of a metal zipper. A heavyweight wool jacket would welcome the strength and rigidity of a metal zipper and would not sag from its weight. Separating zippers are also available in a reversible zipper. All sleeping bags have a long separating zipper. Sleeping bag zippers are available in black and are 100" long. Doll clothes require a tiny, short zipper. Separating doll clothes zippers are available in 4" and 6" lengths and five colors. When you don't need a separating zipper, a lightweight all-purpose zipper can be used in doll clothes by shortening the zipper. handbag or purse zippers have two sliders so you can open the zipper from the center. They are wonderful for any bag or tote project. A coverall zipper is a sturdy zipper with a top and a bottom locking sliders so the zipper can be opened from either end. They are available in two colors and lengths of 22", 24" and 26". Most zippers are sized in lengths at 2" intervals. The length marked on the zipper packaging is the length of the zipper, not the length of the cloth tape the zipper is attached to. If you are designing a bag, for instance, you'll need to have an opening longer than the length of the zipper to allow for the space needed at the ends of the zipper. When looking at zipper packages and the one you want to replace, you may find that a replacement zipper is not available in the same length. One option is to shorten a non-separating zipper to meet your needs. A separating zipper is shortened by turning under the top of the zipper and trimming in the seam allowance area. Keep the bottom of a separating zipper intact to allow for opening and closing it.